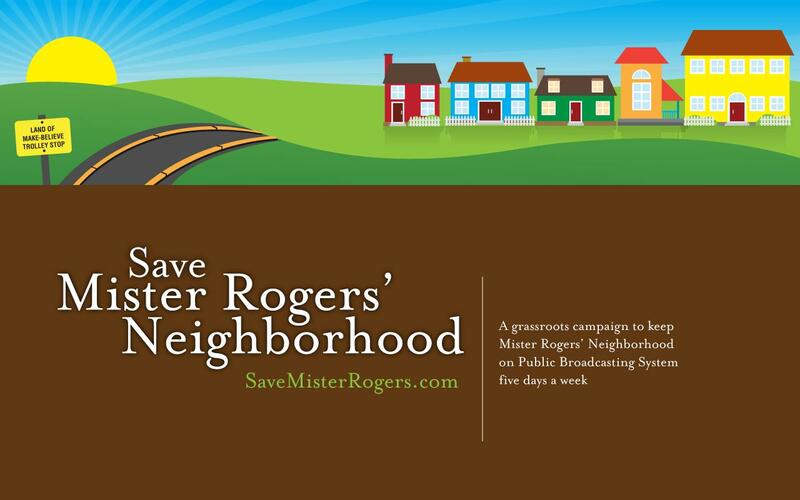 PBS is in effect cancelling Mister Rogers’ Neighborhood. instead of airing the shows throughout the week (as they are made to be shown), one episode will be aired on Saturday mornings. it’s not nothing, but it shows that PBS is concerned more with numbers–of viewers, of dollars–than with people. i didn’t grow up watching Mister Rogers. my love for his work is not nostalgic. i only started watching as an adult. an adult caring for a child. his simple, lovely songs really changed the way that i cared for Garrett and Gracie…”once i was very little too, now i take care of you” and “what do you do with the mad that you feel?” i got to tell Mister Rogers how much the half hour that we spent with him meant. i got to send drawings by Garrett and Gracie. i got to send him a zine. and he accepted our story and gifts with such gratitude and humility. we took his songs with us to the jungle and translated and taught Saramakan children to sing “Tree Tree Tree.” and now we are sharing the neighborhood with Mabel. when she wants her coat zipped, she asks, “beautiful day?” she’s interested in trains and aquariums and those come straight from the neighborhood. i’ve had such an awful feeling in my stomach all day. oh no! the saturday morning slot is where they put shows to die. does opb not have a local say in the programming line-up, too? mister rogers is nostalgic for me, and doubly so since my girl watched him for years and now she still enjoys sharing the show with her little brother who, in turn, adores it, asks for it, sings the songs to himself. this is hugely upsetting to me. i almost called you as soon as i found out! from what i understand, OPB can still air the show weekly, but it is not a part of the PBS package feed. it must be purchased by each station separately. for instance, Seattle will still be buying it, and Oregon will not. you’ve been saving episodes on your computer, no? we only have a handful! i couldn’t figure out how to burn them to disk, so we’ve only got about ten on an external hard drive. dang. i am going to start saving them every day i guess. i don’t have much time. so then i sent them a long email from their contact page (i forgot to cut and paste it before i sent it, i meant to repost it on my blog) and now i’m going to go write a post card to pbs. man. my girl is outraged!